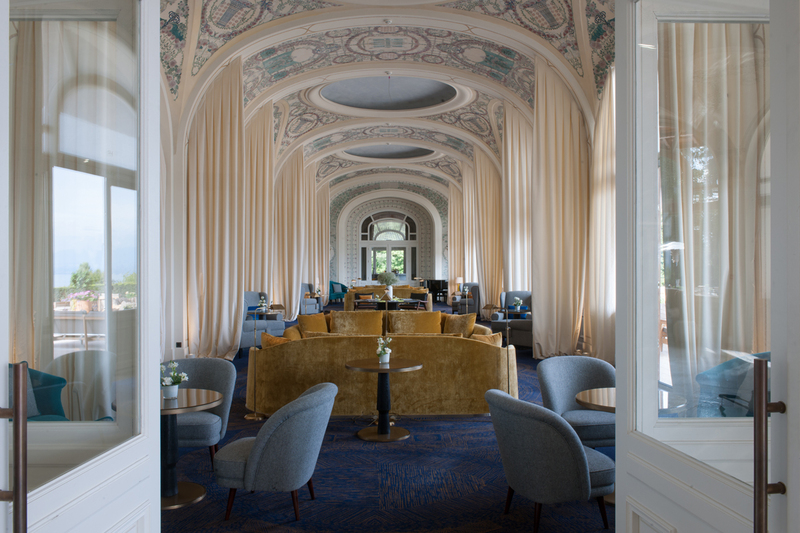 In 1905, the evian mineral water company commissioned the construction of a luxury hotel. A name was needed that would reflect the prestige of its future guests including king edward VII of england who had promised to be one of the first to stay at the new hotel. As so it was that the royal hôtel opened on 16th june 1909. The king died in 1910 without ever having visited the suite set aside for him. The name “royal” remained. July, the 3rd 2015. Entrusted to interior designer François Champsaur, and head architect of historic monuments, François Chatillon, the renovation of the hôtel Royal was a large-scale project while combining historic heritage with the latest trends in contemporary design. 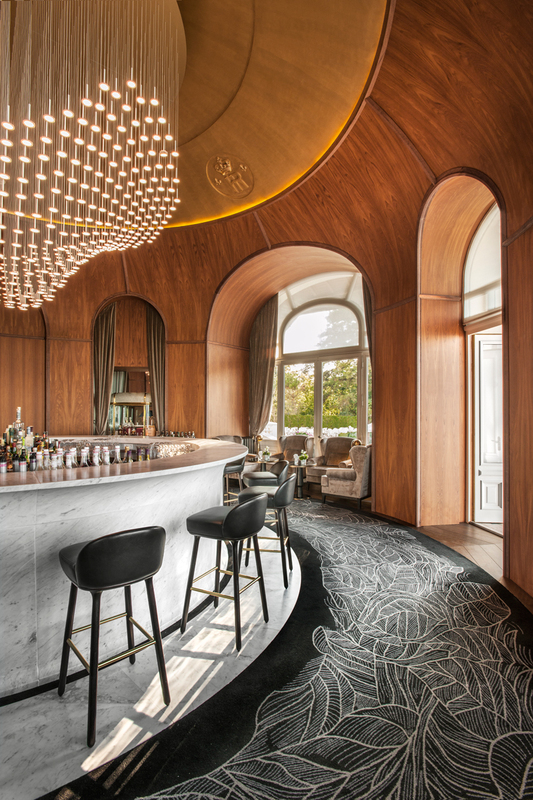 Entrusted to interior designer François Champsaur, and head architect of historic monuments, François Chatillon, the renovation of the hôtel Royal was a large-scale project while combining historic heritage with the latest trends in contemporary design. Ideally located between Lake Geneva and the French Alps, Hotel Royal enjoys an exceptional setting and views in the heart of a 42-acre park. 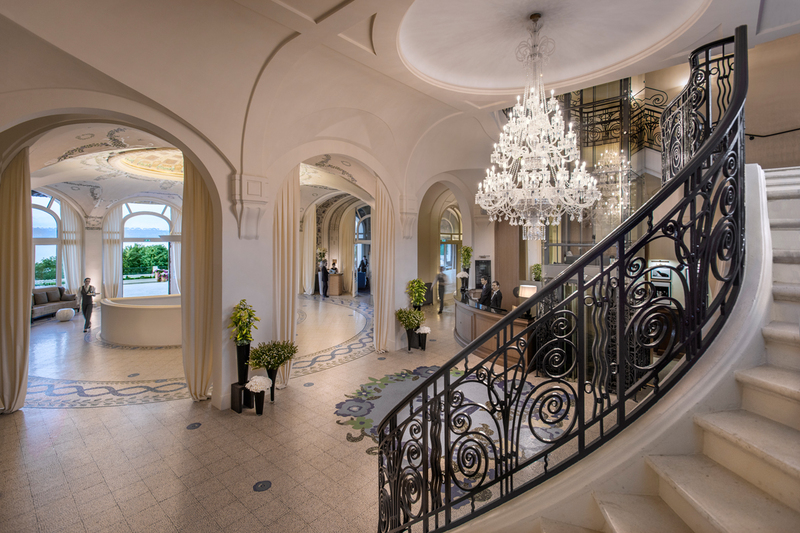 Easily accessible, the Hotel Royal is just 45 km far from Geneva international airport. The town with pedestrian streets and architecture from the beginning of the century really offers a true French Art the Vivre experience. The Evian mineral water spring and Thermal bath with the famous Evian mineral water swimming pool but also Yvoire medieval town or Chillon Castle, luxury shopping in Geneva or Lausanne, the Mont-blanc and Aiguille du midi. The region is also well-known for its gastronomy experience with cheese or chocolate factories visit or wine tasting in UNESCO classified wine yard. Between lake and mountain Evian is also a unique destination for all those who love the great outdoors, offering a wide range of water-based and mountain activities. Some famous guests along the time : The Sultan of Zanzibar, the Maharaja of Kapurthala and Queen Amélie of Portugal. Sacha Guitry, Yvonne Printemps and Jacqueline Delubac. Greta Garbo The Aga Khan Errol Flynn and Ludmila Tcherina. In June 2003, the Evian Resort hosted the G8 summit. A place totally dedicated to children’s happiness and fulfilment where they can enjoy activities they choose with specific facilities suited to each age group. Over 1,000 m2 facilities with 5 different areas designed to cater to children based on their age and needs. They can have fun indoors at the covered, supervised pool and paddling pool while a vast safe, outdoor play area awaits them when the weather is fine. The rooms have beautiful view on the private park of the hotel or on Lake Geneva. 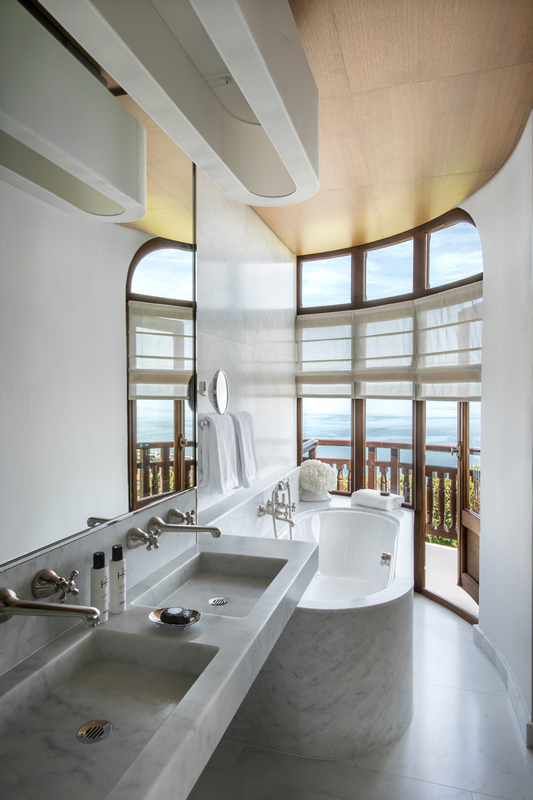 Rotonde Junior suite : 58m² with a panoramic balcony. 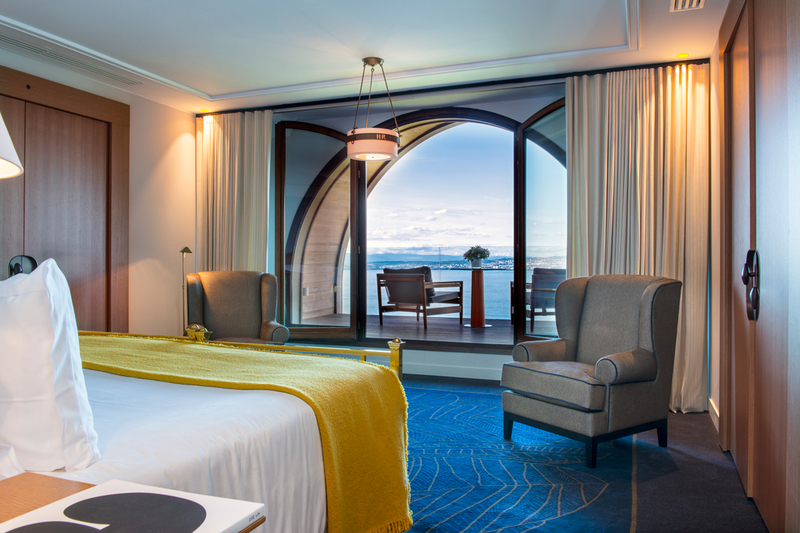 Exclusive junior suite: 62m² with private access, a separate lounge and a panoramic terrace. 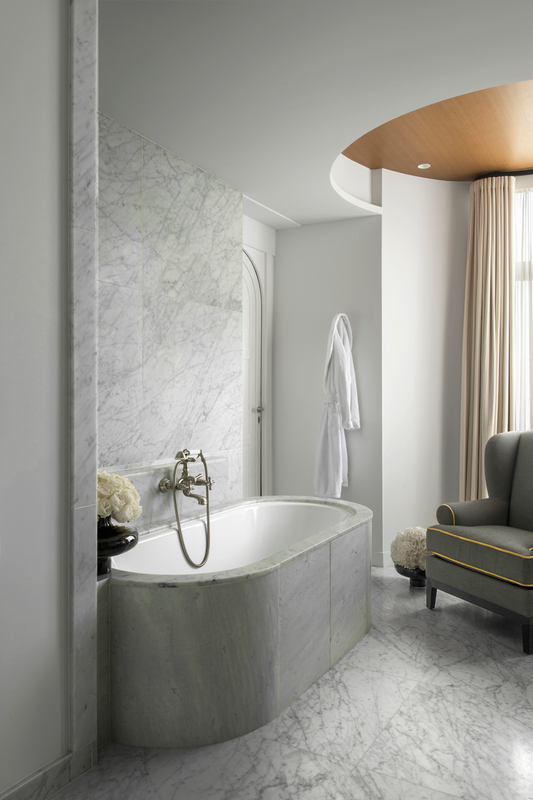 Belle Epoque suite: 94m², with a separate lounge and panoramic balconies. President suite: 99m², with a separate lounge and a panoramic terrace. Exclusive President suite: 92m², with private access, a separate lounge and a panoramic terrace and a balcony. 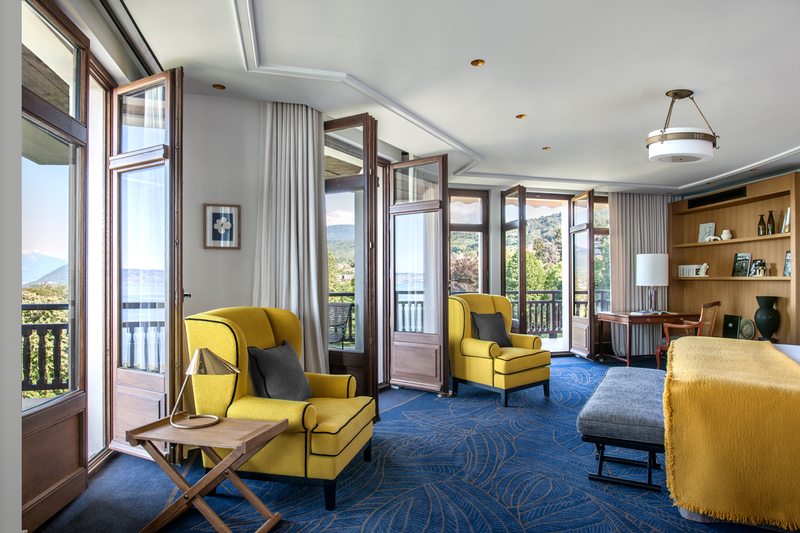 Edward VII suite: 165m², with a large living room and a panoramic balcony. 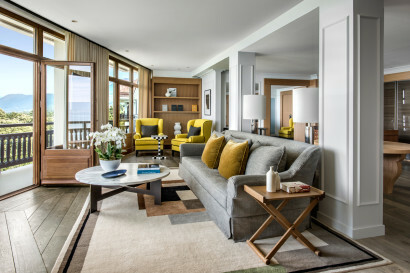 Royal suite: 207m² with private access, a large living room and a panoramic terrace. 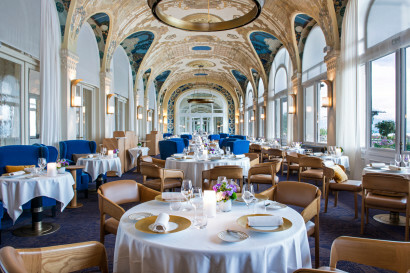 Les Fresques restaurant in Evian is the Evian Resort’s high-end restaurant, offering a stylish, contemporary and elegant setting. Inventive, stylish cuisine made using outstanding ingredients. 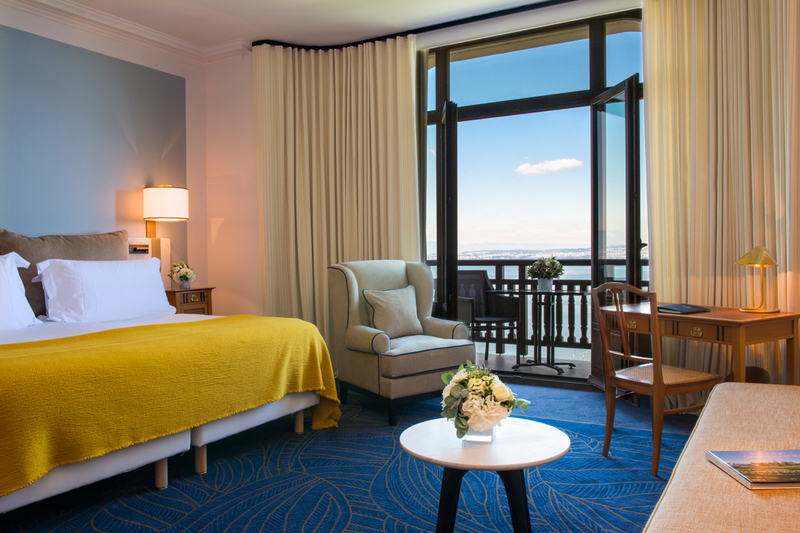 The hotel’s trendy and unmissable place to be, at any time of the day. A place that is decidedly elegant and timeless, with subdued music, chatting and sweet treats by our Pastry Chef. La Veranda serves generous international cuisine. A culinary journey around the world, in a relaxed atmosphere under a ceiling by Marco del Re. In summer, L’Oliveraie takes over from La Véranda. Under the centennial olive trees, lunches are taken near the pool. The restaurant serves Mediterranean-style cuisine. 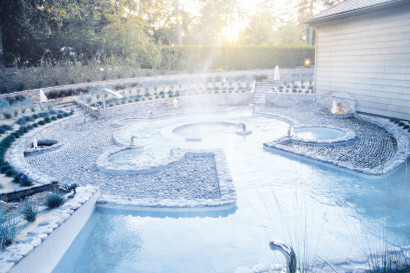 The SPA EVIAN SOURCE®, at the source of Well-Being. For a unique experience, the Spa Evian Source®, offers serenity and well-being in a place that is soothing and deeply energising, a place of lasting revitalisation for body and mind. • The Evian Resort can host all corporate events, for 10 to 1000 people: 2 hotels, 4 and 5 star, 228 rooms, 2 500m² of functional and flexible congress infrastructure, 25 meeting rooms, one wooden auditorium of 1,200 seats, 11 bars and restaurants. • Enjoy luxury amenities of a five-star hotel with panoramic view to organize reception or weddings. Evian Resort Golf Club and Academy: 18-hole course (6595 yards – Par 72) A legendary championship course combined with the beauty of its exceptional setting, the Evian Resort Golf Club, hosts every year only major in continental Europe. The Golf Academy : Unique in the world, whether for training, improving or simply having fun… all of golf’s constraints are removed to keep only the best of the game. The Sport and culture services : From skiing in Les Portes du Soleil, the world largest cross-border ski domain in winter or enjoying all year round outdoor activities as competitive running, via ferrata, hiking and mountaineering. 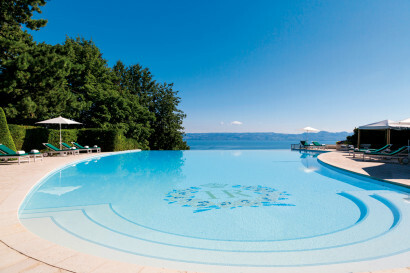 But also experimenting in summer the enchanting Riviera atmosphere of the lake, a blend of yachting, rowing, sailing, water skiing, canoeing, paddling or just enjoying a nice swim.